This problem area came about in two ways. 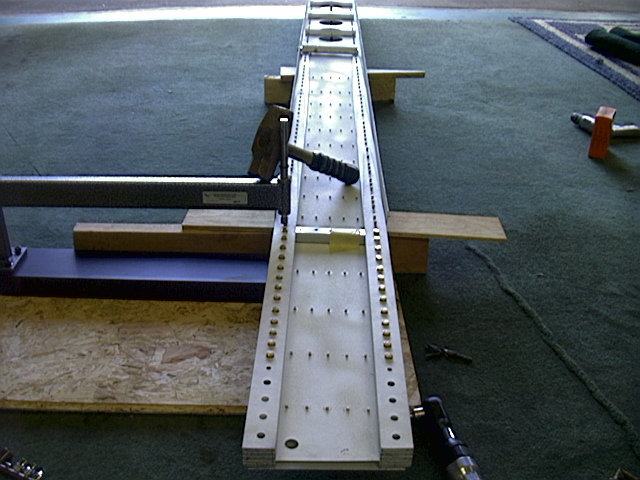 First, I used the c-frame sledge hammer method of setting the rivets in the spar. See that section for details. 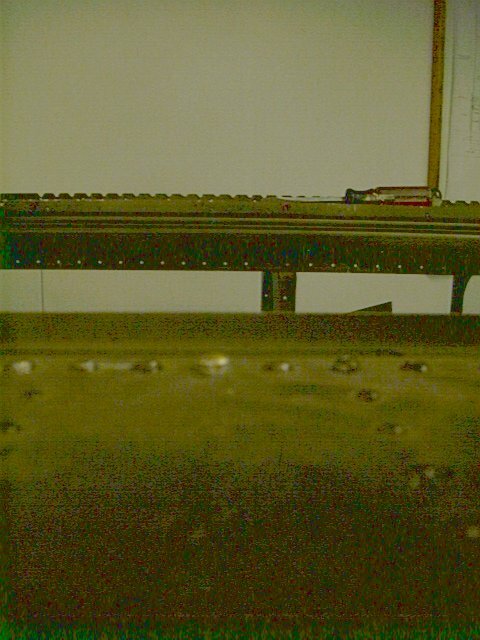 Second, I did not ensure that the spar and rivets where perfectly secure when beating the rivet with the sledge hammer. As seen in this picture, this is the rig I used. This is the problem i encountered below. Its a very bad picture, but the rivet just left of center is not flush to the spar like the others on each side of it. It is raised a bit , about 1/8th of an inch. Meaning the head is not sitting down on the web of the spar. Now the rivet is swollen between the head and the web keeping it from moving around, but this is not acceptable. I had about 10 rivets like this and was caught by my technical EAA advisor visit. WHEW!! What's the cause? Like I said 2 things, my technique of setting the rivet and not paying close attention to each rivet to catch this early on. So how do you avoid this? 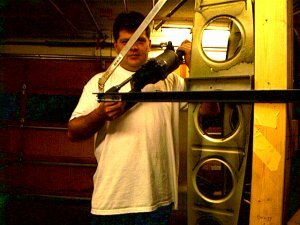 My technique of sledge hammer to spar allowed for some bouncing of the spar after hitting it. Like when you hit a piece of 2x4 sitting on concrete. The wood will bounce up . This is what happened to me on the spar. It would bounce a bit, allowing the rivet to fall back a bit and not sit flush to the web of the spar. Had I of noticed this early on, I would have put lot of weight on each side of the spar where I was banging. Maybe used a concrete block on each side. This would have kept the lifting up of the spar to a minimum and not allowed the rivet to move. How did I fix the problem? Well thanks to my buddy Paul whom I met on the internet, he lent me his monster pneumatic rivet squeezer pictured below and it squeezed my bad rivets into good ones. Many thanks to Paul for sending me his squeezer. It saved me from drilling out the bad rivets which I absolutely did not want to do. And while I was at it, I re-squeezed every rivet on the spar. THANKS PAUL!!!. As a side note, and an example of how problems snow ball, while using this squeezer, I broke the drive pin and bent the c-frame shaft. This cost me a weeks worth of down time, and lost sleep, while I ran around getting parts. Its bad enough to break my own stuff, but even worse to break a friends tool. But I fixed it with upgrades and that wont happen again.